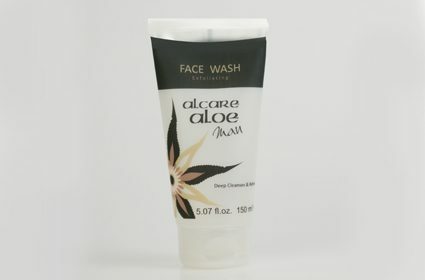 Alcare Aloe MAN Exfoliating Face Wash are a specially formulated Face Wash with a gentle exfoliating action effectively cleanses skin from everyday dirt and excess oils. All Aloe Ferox is harvested in the wild in an ecologically friendly way. Use every morning and night. Wet face with lukewarm water and apply cleanser with light circular movements. Rinse off and pat skin dry. Use in conjunction with Alcare Aloe Man Moisturiser and Triple Action Gel. Aqua (Water), Glycerin, Aloe Ferox Leaf Extract, TEA-Lauroyl Collagen Amino Acids, Sorbitol, Cocomide DEA, Allantion, Propylene Glycol, Carbomer, Triethanolamine, PEG-40 Hydrogenated Castor Oil, Trideceth-9, Methylisothiazolinone, Iodopropynyl Butylcarbamate, Parfum (fragrance) Alpha-isomethylionone, Hydroxyisophexyl-3-cyclohexene, Carboxaldehyde, Limonene, Linalool, Passiflora Edulis Seed Powder.